Will 2017 hay prices soar or bore? Make it three — three consecutive months when hay prices have pushed higher, according to USDA’s Agricultural Prices report released last week. But should that excite hay market sellers and depress those on the buying side? Let’s take a deeper look. The all-hay price bumped to $143 per ton, up $11 per ton from the previous month and only $1 lower than April 2016. Hay other than alfalfa was up $5 per ton from $127 to $132, which is $7 per ton higher than April 2016. The positive sign here is that hay prices are at least holding steady with 2016. Year-to-year hay prices have been in a continual decline since 2014, and the last time the April hay price was higher than the previous year was 2013. The month-to-month alfalfa price was up $13 per ton in April to $148 per ton, which is $6 per ton less than one year ago. 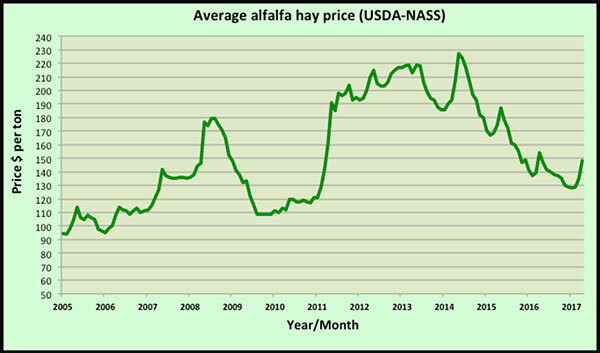 After hitting a low of $128 per ton in January, the alfalfa hay price has climbed $20 per ton over the past three months. Last year, over that same period, the hay price raised only $13 per ton. 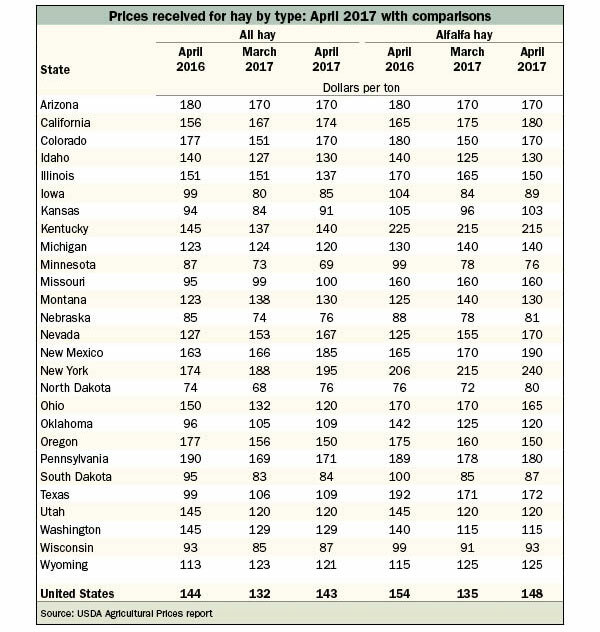 The largest alfalfa price gainers in April were New York (plus $25 per ton), New Mexico (plus $20), Colorado (plus $20), and Nevada (plus $15). Illinois led price decliners at minus $15 per ton, followed by Montana and Oregon, both at minus $10 per ton. The highest alfalfa hay prices are being reported from New York ($240 per ton), Kentucky ($215 per ton), New Mexico ($190 per ton), California ($180 per ton), and Pennsylvania ($180 per ton). The lowest prices can be found in Minnesota ($76 per ton), North Dakota ($80 per ton), and Nebraska ($81 per ton). 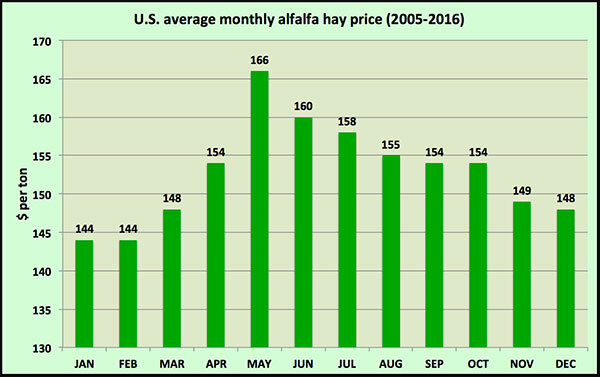 Historically, the monthly average alfalfa hay price peaks in May as supplies tighten before new crop is made (see chart below). It then falls through the growing season and into winter as inventories are replenished. Last year, the USDA alfalfa hay price climbed from $137 in February to $154 per ton in April, then plummeted to $129 per ton by the end of the year. So, is there reason to be optimistic that hay prices will strengthen in 2017 even though the recent upward movement is not atypical from years gone by? I think there is cause to be hopeful, but there are also reasons to temper that optimism. Let’s take a look at both. · The year-to-year free fall in hay prices appears to have tempered. · U.S. May 1 hay stocks were down 3 percent, the first such year-over-year decline since 2013. Some large hay producing states were down considerably more than 3 percent. · Initial reports of new crop hay sales in the West are $20 to $25 per ton more than was seen last year. · Alfalfa winterkill was more widespread in the Upper Midwest in 2017 than in the recent past. · Excessive rainfall and flooding in several regions this winter and spring caused damage to existing stands, wilting forage, or, in some cases, stored hay. · Milk prices may have hit bottom and are expected to climb through the remainder of 2017. At the same time, the nation’s dairy herd continues to grow. · Beef prices have shown recent strength, and the cow herd continues to expand. · Acres of new alfalfa seedings were down in 2016, and that trend is expected to continue in 2017. U.S. acres harvested for dry hay are also expected to drop by 650,000 acres compared to 2016. · Export markets remain strong, and there is no indication that it will slow down. Total hay exports set a new single-month record for volume in March, eclipsing the previous March’s total by over 95 metric tons. · Commodity prices will be higher in 2017 as many acres of corn and soybeans will be planted late or have to be replanted. Higher forage livestock rations may be desired. 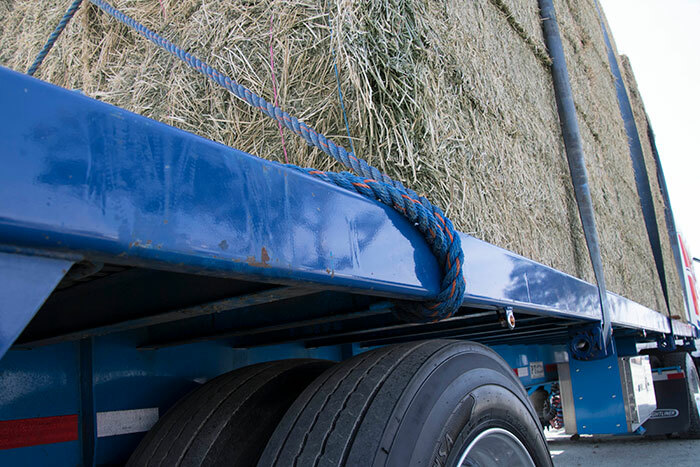 · Hay prices climb every year from January to April. In fact, the U.S. 2017 average alfalfa price for April remains below last year. · Though May 1 hay stocks are down 3 percent, they are still historically high. Only 2015 and 2016 had a larger May 1 inventory during the past 10 years. · Inventories of haylage are excellent on most dairy farms. For many dairy farms, winterkilled fields can be replaced with new seedings before feed shortages become a problem. · Currently, only 3 percent of the nation’s hay acreage is within an area experiencing drought. It was 8 percent one year ago. · More than adequate rainfall in many areas of the U.S. has allowed for excellent pasture growth and the ability to make more hay from pasture acres for future feeding. · Though beef prices are on an upswing, price volatility remains a big concern. · Dairy producers are still feeling the effects from a long run of low milk prices. Some may remain unwilling to pay a premium price for dry hay. The margin for hay-supply error has certainly narrowed, and there is good reason to believe that prices have hit bottom. But how much upside is there going to be relative to 2016? That’s really the pertinent question. I believe it will mostly hinge on Mother Nature and livestock prices, though other factors will play supportive roles in specific regions. For example, both export and dairy markets compete for available hay resources in the West.